If you ever wanted to learn how balloon artist create their magic, then this kit is for you. 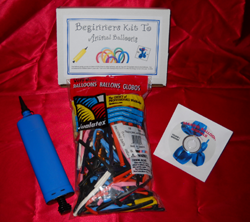 Whether you are kid looking to twist balloons, a parent looking to make your little one's birthday party extra special or you just want to make someone smile you can with Melvin's Beginner Balloon Kit. Learn how to make a puppy, giraffe, a flying mouse, flower, bunny-rabbit, ladybug bracelet, and a swan. You will be a pro in no time! The balloons in your kit are Qualatex brand balloons, the best on the market and what most professionals use including Melvin. This kit comes complete and ready to use with everything you need. You get a professional balloon pump, 100 Qualatex brand balloons and a DVD where Melvin teaches you how to twist and create balloon animals.